WebSite X5 is an all-in-one solution packed with tools to create and publish professional websites, online shops and blogs in just 5 easy steps: 1. Choose website design, select from one of the 1,400 templates from within the software or a unique design either by modifying one of the pre-designed templates or create from scratch 2. Layout the website, decide on what information needs to be presented 3. Enter the content, using the drag 'n' drop interface to add the words, images, sounds, videos and much more 4. Select the advanced features to be included; Online Shop, Blogs, RSS feeds, Reserved Areas, Multi-language Welcome Pages 5. Put the website on the Internet using the built FTP tool WebSite X5 helps at every stage, every step is accompanied by intelligent advice to show just what is required to turn an idea in to an eye-catching website. WebSite X5's templates design the page - all users need to do is drag and drop objects to create pages. With a selection of website objects to choose from including videos (with support for YouTube), image galleries, integrated e-commerce with partners such as PayPal, podcast and RSS content, plus video and Flash animations - creating a professional website could not be easier. 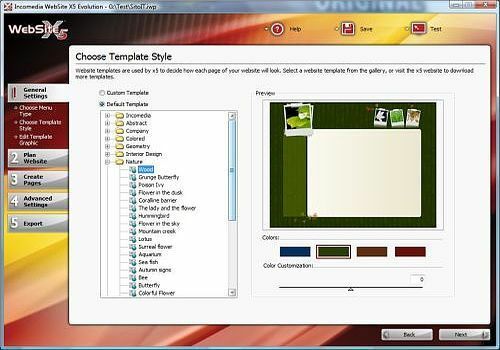 WebSite X5 includes many great tools such as built in Image Editor, making it unnecessary to use external graphic programs. With the Automatic Image Compressor images are automatically compressed and resized for the Internet - no need for any external image optimization. WebSite X5 is the perfect answer for in-house web design. WebSite X5 generates all the programming code required, connects to the service provider and uploads the website in minutes. X5's advantage is that users do not require any previous experience in Web Development, Programming or Design to user the software and create a website. TidExpress est un éditeur HTML avec prévisualisation et module Tidy pour HTML5. Son interface est très simple à utiliser. Il dispose d'une insertion automatique de balises HTML, ainsi que d'un module Tidy pour vérifier la validité de vos pages.